Alcoholic drinks in excess contribute to weight gain by substantially increasing caloric intake. However, alcohol displays its two-faced character again in its effects on body weight, making many scientific studies contradictory. Multiple studies show high intakes of hard liquor are linked to weight gain, although this may be the result of the regular consumption of hard liquor with sugary soft drinks, juices, and other mixers. On the other hand drinking beer and, even more so, red wine, is not consistently linked to weight gain and in some studies actually decreases weight gain. The contradictory results of scientific studies that have examined the association of alcohol intake with body weight are partly due to the fact that alcohol contributes calories to the diet. When alcohol is drunk in excess, it reduces the secretion of pancreatic juice and damages the lining of the gastrointestinal system, impairing nutrient digestion and absorption. The impaired digestion and absorption of nutrients in alcoholics contributes to their characteristic “skinniness” and multiple associated micronutrient deficiencies. The most common macronutrient deficiency among alcoholics is water, as it is excreted in excess. Commonly associated micronutrient deficiencies include thiamine, pyridoxine, folate, vitamin A, magnesium, calcium, and zinc. Furthermore, alcoholics typically replace calories from alcohol with those of nutritious foods, sometimes getting 50 percent or more of their daily caloric intake from alcoholic beverages. A small amount (up to 10%) of the liver acetaldehyde may accumulate inside the liver cells. As more alcohol is ingested, this stimulates the production of acetaldehyde by both the alcohol dehydrogenase and MEOS systems. As the levels of acetaldehyde increase inside the liver cells with heavy consumption of alcohol, some of the acetaldehyde diffuse into the blood circulation. In circulation, high levels of acetaldehyde cause nausea and vomiting. Vomiting causes more body dehydration and loss of electrolytes. If the dehydration becomes severe enough, this can impair brain function and a person may lose consciousness. Alcohol can adversely affect nearly every area of the brain. When BAC rises, the central nervous system is depressed. Alcohol disrupts the way nerve cells communicate with each other by interfering with receptors on certain cells. The immediate impact of alcohol on the brain can be seen in the awkwardly displayed symptoms of confusion, blurred vision, slurred speech, and other signs of intoxication. These symptoms will go away once drinking stops, but abusive alcohol consumption over time can lead to long-lasting damage to the brain and nervous system. This is because alcohol and its metabolic byproducts kill brain cells. Alcohol stimulates the release of epinephrine from the kidneys. Epinephrine binds to receptors in the liver cells to stimulate the release of glucagon from the pancreas. Glucagon and epinephrine stimulate glycogenolysis in the liver cells. Epinephrine also stimulates the breakdown of triglycerides and glycerol into free fatty acids in adipose tissue and are released into the bloodstream and travel to the liver. A portion of these triglycerides are stored in the liver cells; while, the remainder of these triglycerides are converted to very low density lipoprotein (VLDL). The increased accumulation of both stored triglycerides and VLDL particles inside the liver cells causes a condition called fatty liver or hepatic steatosis. This can impair normal liver function. The more alcohol consumed, the more lipids produced and stored inside the liver cells. These effects are cumulative over time. According to the CDC, 14,406 Americans died from alcohol-related liver diseases in 2007. Although not every alcoholic or heavy drinker will die from liver problems, the liver is one of the body’s main filtering organs and is severely stressed by alcohol abuse. The term Alcoholic Liver Disease (ALD) is used to describe liver problems linked to excessive alcohol intake. ALD can be progressive, with individuals first suffering from a fatty liver and going on to develop cirrhosis. It is also possible to have different forms of ALD at the same time. Excessive alcohol consumption causes the destruction of liver cells. In an attempt to repair itself, the liver initiates an inflammatory and reparation process causing scar tissue to form. In the liver’s attempt to replace the dead cells, surviving liver cells multiply. The result is clusters of newly formed liver cells, also called regenerative nodules, within the scar tissue. This state is called cirrhosis of the liver. 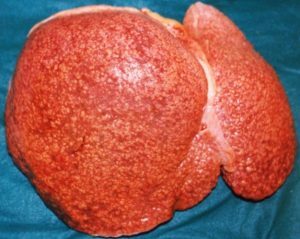 Fatty liver. A rather benign disorder that develops after excessive alcohol consumption; however it can progress to more fatal diseases. 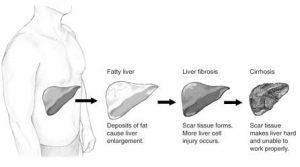 Fatty liver is reversible if alcohol use is brought under control. Alcoholic hepatitis. The symptoms of this alcohol-induced liver inflammation are a swollen liver, abdominal pain, nausea, fever, jaundice, and vomiting. Although linked to alcohol use, even people who drink moderately can sometimes develop this condition, and not all alcohol abusers do. If a person stops drinking alcohol, the liver damage can be reversed. But if they continue, cirrhosis may develop and death can result. Cirrhosis. This serious and sometimes fatal form of ALD develops when liver cells die and form scar tissue, which blocks blood flow and causes wastes and toxins to build up in the system. Strictly speaking, cirrhosis cannot be cured. It can, however, be stopped with medical treatment and complications can be managed if the individual stops drinking, and many do survive. Not all cases of cirrhosis are strictly due to alcoholism, and not all alcoholics develop the disease. Symptoms of cirrhosis include the buildup of abdominal fluid (ascites), abdominal pain, fever, thirst, confusion, and fatigue. As the liver cells release VLDL particles into circulation, this increases the levels of VLDL particles in blood. As VLDL particles continue to accumulate in blood, this cause a condition called hyperlipidemia. In their journey through circulation, VLDL particles are eventually degraded to low density lipoproteins (LDL) particles. LDL particles are also known as “bad cholesterol”. Higher levels of LDL particles in circulation lead to the build-up of cholesterol deposition plaques inside the walls of the blood vessels (known as atherosclerosis). These plaques can impair or stop blood flow to the cells. If an artery is blocked, the cells cannot make enough energy and eventually stop working. If the artery remains blocked for more than a few minutes, the cells may die. When a cardiac artery is blocked, this causes a heart attack (acute myocardial infarction). Depending on the length and severity of the blockage, damage to the cardiac cells may be permanent and irreversible. Once the heart structure and function is compromised, the more susceptible a patient would be to suffer a second heart attack. Health Consequences of Alcohol Abuse by University of Hawai’i at Mānoa Food Science and Human Nutrition Program is licensed under a Creative Commons Attribution-NonCommercial-ShareAlike 4.0 International License, except where otherwise noted.